Dave Lemanczyk clearly demonstrates the extraordinary potential of this simple conditioning tool. With no more than an empty keg (or partially-filled if preferred - more on that in a minute), a small training area and a bit of determination there is a wealth of power available. It really is an incredible tool. The Keg Conditioning package comprises both DVD and printed forms, to both demonstrate and explain the techniques as thoroughly as possible. Dave shares a number of exercises (and variations) covering everything from presses to carries; including some particularly creative forms of each. These alone make the DVD invaluable. The techniques, however, include far more than a simple overview of the exercises (though that is certainly included). Dave carefully explains - and demonstrates - exactly how & why to lift a keg a particular way, where & how to grip the keg; and a number of similar details which can make a world of difference in this type of conditioning work. I mentioned above that the option exists to use a partially-filled keg. 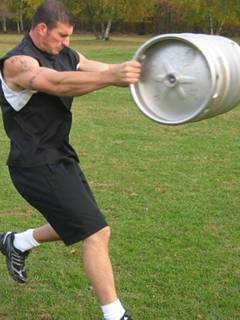 Although all of the exercises are intensely challenging (especially in high volume work) with an empty keg, a simple way to increase the difficulty is to add water to the keg. Not full; a fairly small amount of water (much less than the weight implies, as it'll be sloshing around) makes a significant difference. Try it and you'll see what I mean. Who Would Benefit From Keg Conditioning? In short, anyone that wants to become obscenely strong, have fantastic strength-endurance and be completely indomitable in their chosen sport or activity. It's an incredibly powerful tool. More specifically, well, you. If you love outdoor training as much as I do (and particularly at this time of year), grab a copy of Keg Conditioning. Learn how to do it the right way, and you'll see some amazing changes take place. As I said at the start, I love this package. If you're ready to get yourself some serious strength-endurance, grab a copy of Keg Conditioning. Superb.